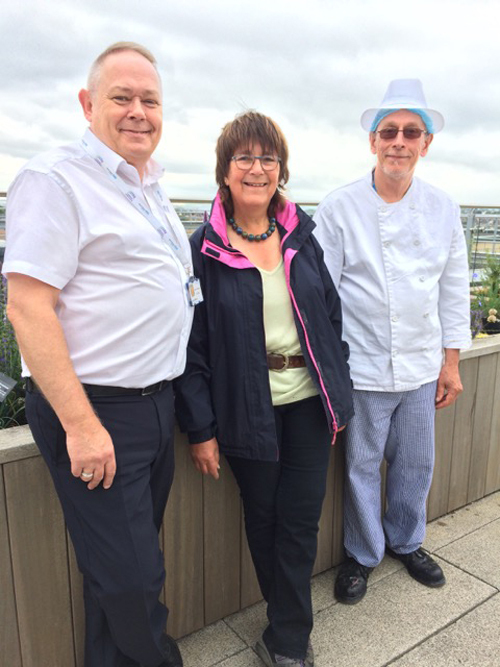 AWARD winning Jekka McVicar has seen one of her latest projects come to fruition with the opening of a roof garden at Southmead Hospital. Jekka, who runs her herb farm in Alveston and designs herb gardens, was approached to create the garden on the roof terrace of the hospital’s Brunel building. More than 30 varieties of culinary, medicinal and therapeutic herbs are now grown to add to meals served to patients and staff, as well as to provide a relaxing sensory area that also attracts bees and other important insects. The scheme was originally the idea of executive chef Gary Millard, with Jekka asked to design and plant the garden. It was funded by Southmead Hospital Charity, Carillion Services and The Hospital Company, with hospital staff being encouraged to help maintain the garden as a way of relaxing and getting health benefits. The garden will also be used to help promote recovery among patients. Jekka said: “I think it’s wonderful that herbs are being used in Southmead’s kitchen for staff and patients. The garden also gives staff a space to come and sit and enjoy the bees and aromas.